We started this week off with another blast from Winter. 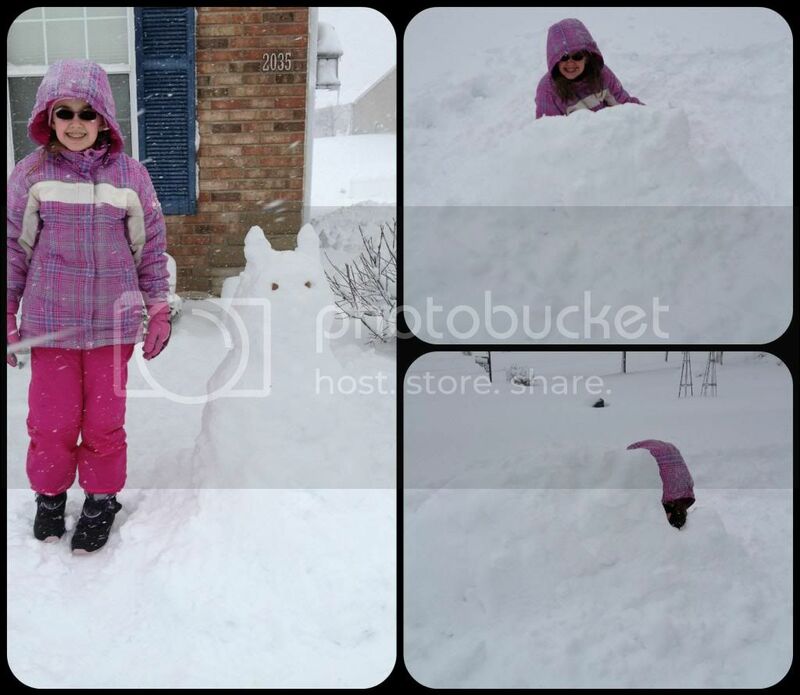 One of the largest snows in decades came on Sunday. The snowfall totals varied throughout the metro area, with our particular suburb receiving the most: 15.5 inches. Seriously, I LOVE Winter, but not when the rest of the world (and my plants) think it should be Spring. It's slowly been warming up this week, and it is entirely crazy to go outside with a light jacket while 3 foot snow mounds and a snow bunny are still in my yard. Amber behind her snow fort, complete with peep hole. In school we feel the end of the year approaching, even though it is two months away. Many subjects seem to be winding up, and some days this makes it difficult to put all of our effort toward school. 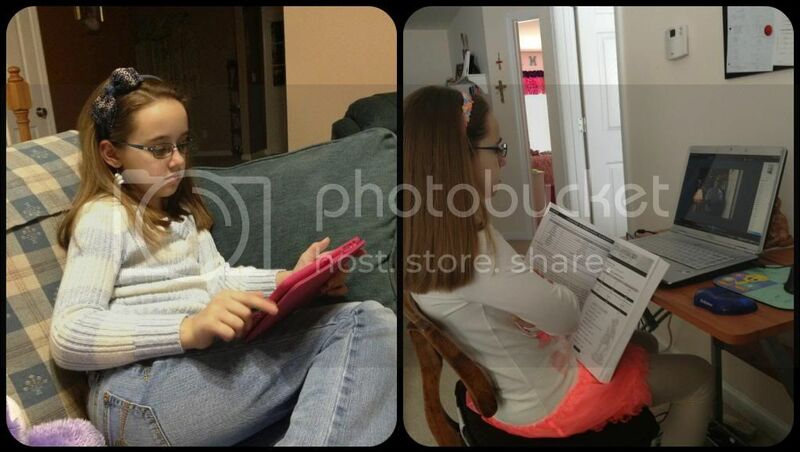 Thankfully, in a couple of weeks Amber will have standardized testing, so that will give us a change of pace. We decided to not take an official Spring Break this year, instead opting for random days off when needed. 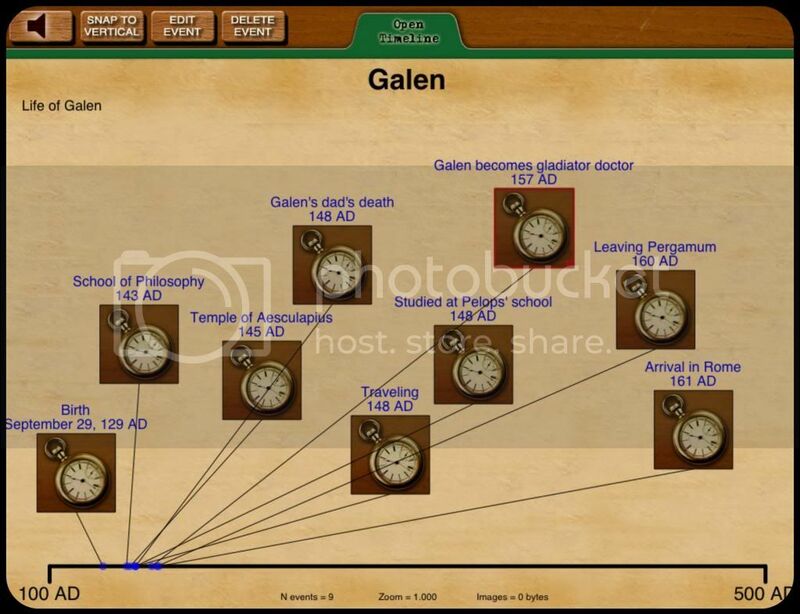 Amber started her Galen study this week, using History of Science: Galen Unit from Elemental Science. She is completing a lesson per day as part of her English and writing lessons. The English curriculum scheduled a biography research paper for the 4th quarter of the year, and the Galen study recommends completing a research paper on Galen as the final project. I decided to combine the two and take a small break from Writing with Skill while Amber works on her research paper. I have been a little disappointed with the instructor fact and date summaries provided in the Galen Unit. We've found dates that are obviously incorrect, and information it expects the student to have added to their facts list which actually aren't presented in the book until later chapters. It appears the best tactic is for me to read along in Galen and the Gateway to Medicine so I can be sure Amber has selected the most pertinent facts for her notes. Unfortunately, this makes a lot more work for me. Galen study - taking notes and preparing for discussion. I do love that Amber works on her note taking skills daily in the Galen unit and she's practicing selecting important events to place on her timeline. We use Timeline Builder from Knowledge Quest on our iPads. This app is so much easier than paper timelines. We've tried various paper timelines, and they never manage to work very long. Amber quickly gets bored with drawing or cutting & pasting pictures for each event. We also have found, especially in our Social Studies, that events are not always chronological because of the way topics are presented. When the timeline is on paper, it is hard to insert events in a previously completed time frame. Amber's timeline, so far. No pictures yet though. With Timeline Builder, Amber can add events at any time without having to squeeze them in to small spaces. She can choose to use pictures from the web, draw her own on her iPad, or even draw them on paper and take a picture with the iPad. The latest updates to Timeline Builder make it even easier to use. If you have tried it out and were annoyed with the end date requirements or need to type BC / AD into the date fields, they have fixed these issues. Yay! Those were the most important for us. Also this week, after quite a bit of thought, our family made a few changes to Amber's activities. Amber loves dance. She simply isn't happy when she is not in dance classes. However, she bit off more than she can chew this semester. Three consecutive days of dance (7 classes) mixed with Chimes, Piano, Musical Theater and the occasional Girl Scout activity was just too much. The third dance day was for a single technique class, Leaps & Turns. The turnout for the class had dwindled down to Amber and another girl. We decided to drop it as well to make our week easier. Happy bunny-girl working on astronomy. No rushing to dance on Wednesdays anymore. Girl Scouts has also been proving to be difficult. Amber hasn't been able to make the bi-monthly meetings this semester due to dance classes. It has become difficult for her to participate with her troop for any events at all, and causing some hard feelings because she chose dance over the GS meetings. Officially, as of today, Amber is a Girl Scout Juliette. This means she is without a troop, but a full Girl Scout and can now work on patches and her Bronze Award on her own or with other Juliettes in the area. We hope this helps everyone involved. Though, I'm a little stressed about being totally responsible for the Bronze award. Thinking ahead to the fall, Amber is not sure she wishes to continue with the Girl Scout program. She doesn't want to rejoin her troop, but she'd like an activity with a group of girls - preferably closer to home than her GS troop. There is an American Heritage Girls troop that meets less than a mile from our house. We have contacted them for more information and may do a trial visit sometime this Spring. Really, we need to know more about AHG before we commit to it. I know so very little, and the coordinator for our area is fairly slow at answering email (like weeks for one email). If anybody has anything to offer about AHG, I'd be thrilled to hear! and watching the newest Latin Lesson. One last thing, between now and the next weekly update our previous house, that we have rented out for the past 6.5 years, will be up for sale. We moved to the subdivision across the street from that house 6.5 years ago, and I drive by it multiple times a day. It is a constant source of anxiety and stress for me. We have put a good deal of money into the house this past month and are now hoping to sell it. I'm extremely stressed over this whole situation and ask for prayers that it sells quickly, or at least before I end up medicated (LOL!... sorta). Us too! We have 44 days left this year...and it's getting a little harder each day (with the warmer weather) to focus on school. We're up-and-down about continue Girls Scouts too. My girl has been with this troop since Kindergarten, but she's become more and more disconnected from the girls. And I had a safety issue come up the VERY first outing of the year: her leader didn't provide my girl water ALL DAY at an outdoor, physically active event that caused dehydration and vomiting/severe headache for 12 hours. So...we're not sure! 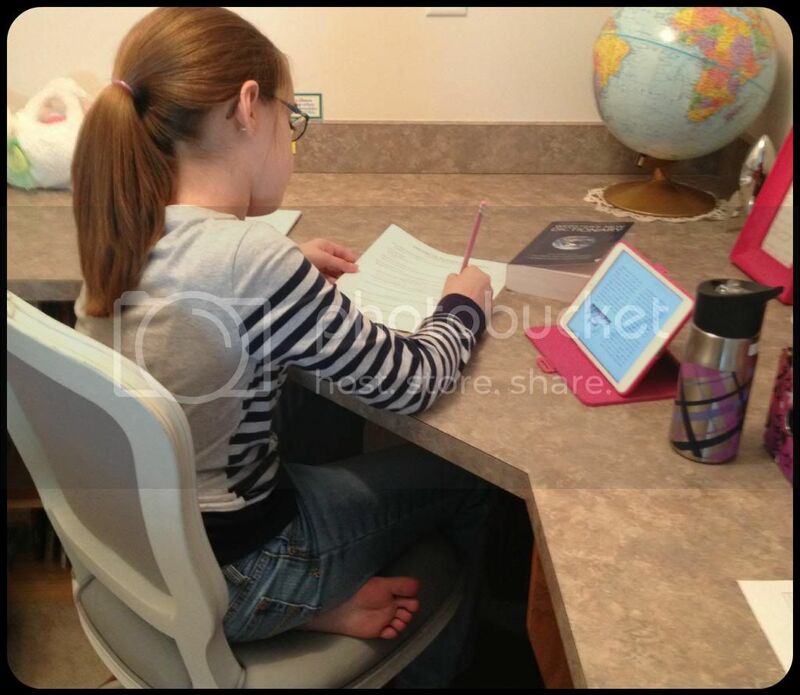 Amber has only been in the troop since 3rd grade, and has felt more and more disconnected since she began homeschooling. It's just not her priority and they want it to be. Unfortunately, Amber's therapist agrees that it shouldn't be her priority and that it's not most emotionally healthy activity. So there wasn't any safety issues for us thankfully, just schedule problems and, to be honest, each time Amber is with that group she has an emotional set back. How do you tell the troop leader that type of thing? We made a snow bunny, too, although we didn't get as much snow as you did. Have a wonderful Easter! You have a great Easter too! One of my children wore bunny ears all week. We just went through selling a house. We sold it in 10 weeks. I hope the market treats you well.